Democrats say they had a record crowd for the County Chairs' Associations's annual State Fair brunch. 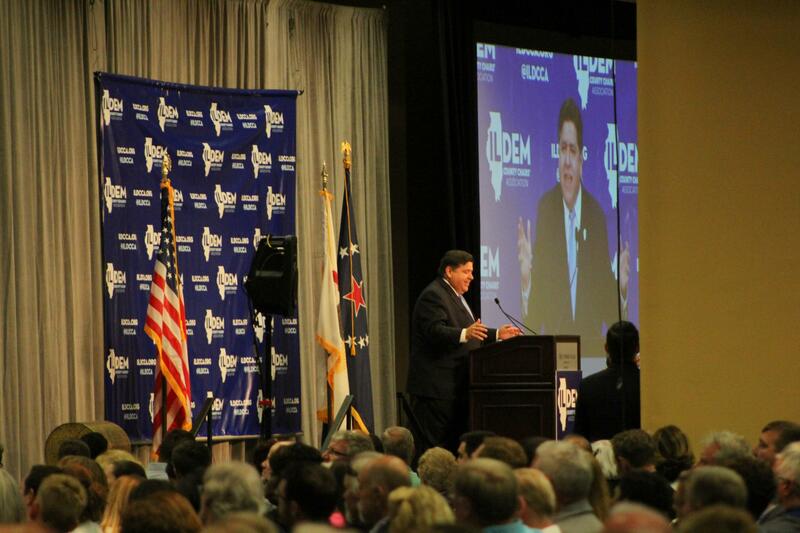 J.B. Pritzker speaks at the 2018 Illinois Democratic County Chairs' Association's annual State Fair brunch. The state fair brunch meeting is typically Illinois’ largest annual gathering of Democrats. They began by stressing how united they are as a party heading into the fall campaign. And with a quick “thank you very much,” Madigan was gone. Republican Gov. Bruce Rauner has spent millions of dollars portraying the speaker as the worst person in the state, and succeeded to the extent that Madigan has become a liability for fellow Democrats. 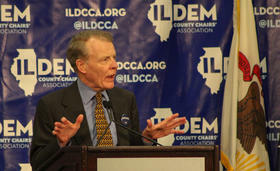 Madigan left the event after his brief remarks and was not mentioned again. Although Republicans tried to sound a similar theme of unity at their State Fair rally, Democrats have a better case. Near-billionaire Rauner barely won the primary election, defeating his poorly-funded conservative challenger by just three percentage points. Meanwhile, the Democratic primary yielded a winner who came out 18 percentage points over the runner-up. Pritzker, like most of the other Democrats who spoke, spent a significant portion of his speech criticizing the policies and personalities of both President Donald Trump and Gov. Rauner. Pritzker was speaking at an event where a record number of tickets had been sold — more than 3,000. The surge in interest came after the Illinois Democratic County Chairs’ Association announced former Vice President Joe Biden would be the keynote speaker. But Uncle Joe, as some Democrats call him, came down with laryngitis. 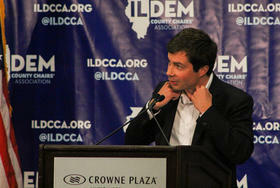 So the Illinois Democrats turned to Pete Buttigeig (pronounced BOOT-ih-jehj). “It is a great honor to be invited here, even knowing that I may have been invited here as an act of desperation,” he said. Buttegieg is the mayor of South Bend, Indiana, and a rising star in Democratic politics. He ran for chairman of the Democratic National Committee last year. Like just about everyone else who spoke at the rally, he got in his share of jabs at Gov. Rauner and President Trump. But he had another message, too: that Democrats need to start competing in more elections: not just for president or Congress, but “getting in on school boards and building up statehouse majorities. “Now is the time for Democrats to stop treating the presidency like it’s the only office that matters,” he said. Buttigeig says while Republicans have “lost their minds,” Democrats have lost their voices. “When we knock on those doors and make those phone calls, on our lips there must be not just the failures of those in power today — though they be many, so many — but we’ve got to talk about our values, Democratic values, which are American values,” Buttigeig said. He says Democrats need to reclaim the mantle of “freedom” from Republicans — like the freedom to start a business or change jobs because you know you won’t lose your health care. “How about that kind of freedom? Or the freedom to drive in a car or walk in your own neighborhood or browse through a department store without worrying you will be made to feel unwelcome because of the color of your skin,” he said. Democrats in Illinois, like those across the country, see the possibility of a “blue wave” this fall. And it won’t be all that surprising if they can defeat an unpopular Republican governor. 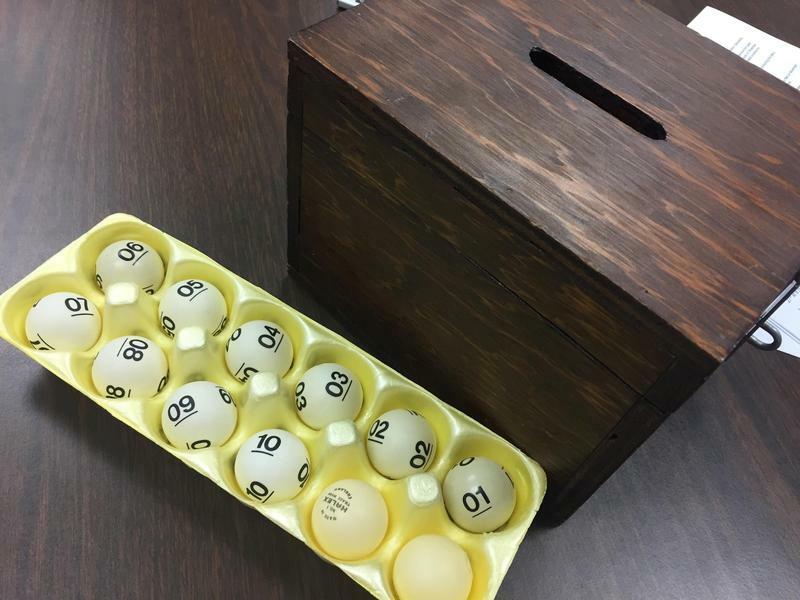 But as we’ve heard, their ambitions extend much further down the ticket. Whether they can compete in farm country — Trump country — flipping red Congressional districts to violet or even blue — that’s the real test Democrats have set for themselves this November. Illinois State Representative Norine Hammond (R-Macomb) won her party's primary election this week. 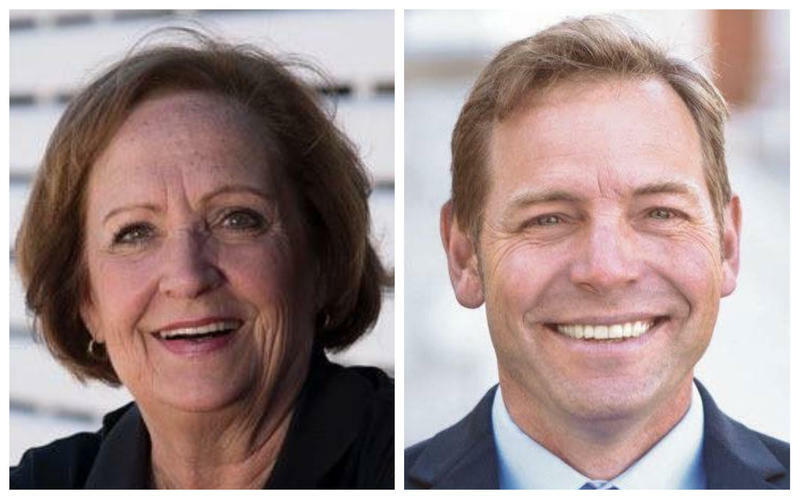 She'll face John Curtis of Macomb in the general election. He ran unopposed in the Democratic primary.